The new Hashtag Hunter Profile series on Sportsmen’s Nation highlights hunters from Instagram whose photos from the field made us pause and take note. Sharing a conversation with the camo-clad Instagrammer, we dig deeper into the photos that grabbed our attention and the stories behind them. If you are a die-hard sportsman with a story to tell, tag your favorite photos with #HuntTheNation for a chance to be featured on The Nation. 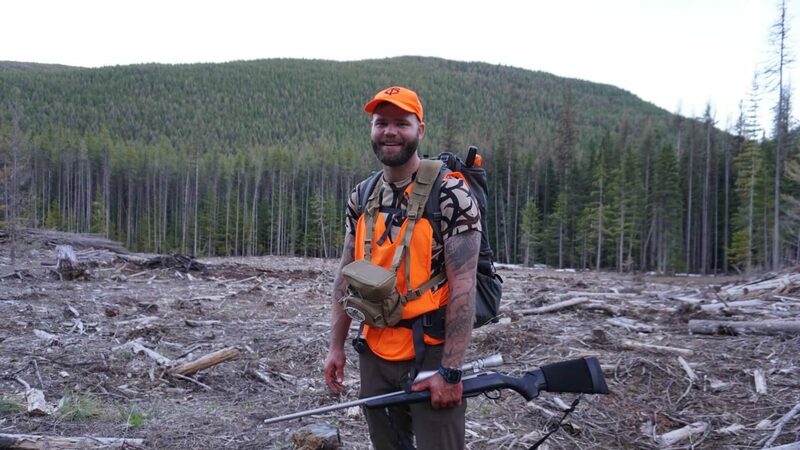 Joe Lang, @joelang84 on Instagram is a working man, husband, father, ultra-marathon runner and self-described “professional daydreamer” who somehow also finds the time to go on some real hunting adventures. Last season was a banner year for him as a hunter, finding success while pursuing bear, elk and deer in Montana and his home state of Minnesota. Beyond Instagram, he shares his love of hunting through media outlet, Contact Outdoors. What brought you to hunting? What got you started in it, and where to you find yourself now? I grew up in a hunting family. My dad has hunted all over North America, from the arctic circle to South Texas. Growing up we hunted squirrel on the 40 acres we lived on and eventually started grouse hunting. That graduated us to whitetail, then turkeys. When I was out of high school I got away from hunting due to playing in bands and busy schedules. It was my first duck hunt at the age of 21 that got me to fall back in love with hunting. I fell headfirst into the world of waterfowl. The last few years my focus has been archery hunting; here in Minnesota it is whitetail and beginning this year, turkey. From January to September my focus is elk hunting. I plan, shoot, tweak gear and train for elk hunting all year. This one is easy for me. Elk. I enjoy hunting them with both rifle and bow but the bow takes the cake. The rut in the mountains is something everyone in the world needs to experience, even if it's in a refuge where all you can do is watch. Checking out your Instagram page, it looks like your 2017 season was one most of us would kill for; spring black bear and archery elk and archery whitetail. Could you give us a quick breakdown of those hunts? Absolutely! Spring bear was a blast. Myself and Brian Hallberg from Contact Outdoors did the trip together. We left my home in Minnesota at 6:30 Pm on Wednesday and we were in our spot around 4 pm Thursday afternoon. We sat on a knob overlooking a large open area to glass. Within an hour a bear stepped out at about 1000 yards out. We were going to wait to see if he would come to us, but I am very impatient and hate to see an opportunity go to waste so we planned a stalk. I thought if I could get to the creek between us and the bear I would be able to get a shot, so I dropped down and worked my way up towards the bear while Brian stayed back to signal for me. Once I got to the creek I realized there was no way a shot was going to present itself. I couldn't even spot the bear from there because he was over a small ridge. Removing my shoes, I crossed the creek and continued on barefoot as I did not know how far he was out. Slowly I worked my way to a spot that I was able to get a shot from. The wind in my favor and my bare feet reminding me to move slow and deliberately, the bear never knew I was there. At about 100 yards I was able to harvest a beautiful spring bear in Montana. Once we got him cleaned up and packed out I looked at Brian and said, "In 28 hours, we drove to Montana and harvested a bear, that's unbelievable! " We laughed and treated ourselves to a hotel that night. I've got a secret trick to success. Lucky charms. I carried this arrow from one of the kids toy bows on my bear trip and this one as well. This thing is not leaving my pack ever again. Archery elk was in Montana as well. This year I decided to go out solo. I have a hard time finding people that I can hunt with and it's an expensive tag. I went out to a spot my dad used to hunt 30 years ago, thinking about how the landscape changes from generation to generation. Leaving camp I wasn't sure what to expect. Within 1 hour I was mixed in a herd. I called in 3 bulls to 50 yards but each one was hung up and barking at me. So I let them be. The next day I went out well before daylight, eventually hiking 15 miles and never hearing as much as a cow. It was a long day but it told me it was time to move on to an area I had hunted the year before. I got there at midnight and slept in my truck. The next morning, I loaded up for the day, hiking in towards where I knew elk moved. Sure enough they were there. Once I got to the edge of the coolly they were in I noticed the wind shifted. After that it was radio silence. Not even a calf was mewing. I sat down, feeling defeated. Unlike the previous year, there was no water sources in the area, so I decided to work back to the truck to stock up so I could camp that night. On my way back I bumped two nice whitetails which caused me to slow down and really scan the trees the rest of the way. Once I got to the Aspens I took a picture thinking, "This will make a great Instagram post, Quaking Aspens- Elk Heaven." I put my phone away and took two steps. To my left I noticed the body of an elk so I dropped to my knees behind a little pine. I wasn't sure if it was a legal bull so I ranged it and waited. He eventually lifted his head. He was legal! He was in a spot where I wouldn't get a good shot so I decided to wait to see if he would step out. Sure enough, he stepped out perfectly at 30 yards. The arrow flew through him, he went ten yards made a gurgling cough and tipped over. It was all over in 10 seconds. I literally could not believe it. The only bummer about hunting solo, is not having anyone there to celebrate with! That day it was going to get over 80 degrees and it was already 9:30 am. I worked fast and methodically on that bull. I was able to pack him out in two trips (which I payed for dearly the next few days). He was on ice by 12:30. Thank god I got him on the way back to my truck. The whole reason I started archery hunting was for elk. This was an absolute dream come true. The archery buck was in MN and only a few miles south from my home. That afternoon I raced to my stand with no real hope of seeing much. It was one of those warm muggy days that you don't expect to see deer, but I had nothing better to do. Once I climbed into my stand and got settled it didn't take long before I started thinking, "I shouldn't even be out here today, I'm probably just screwing up future hunts." I was texting Brian about plans for Contact Outdoors and others about random BS. Finally, I put my phone away and sat still, it was the magic hour and I hate that thought of screwing that up. About 5 minutes after putting my phone away, I saw antlers around a tree. There was a buck about 50 yards out feeding lazily. It took him around a half hour to work in 20 more yards. I am a firm believer in not giving them an opportunity to look at me while I am drawn back so I waited for him to get his head behind a tree. I drew back held tight and released. When the arrow went through the buck I thought I missed clean because it went through so fast. Back on the phone, I texted Brian and told him I had completely missed. I waited an hour because I could hear the buck messing around out of sight. Finally, when I went to get my arrow I found it covered in blood. A good sign, but the blood trail wasn’t substantial. I lifted my head and looked around. He was dead 20 yards away! It was a cap to an absolutely phenomenal year. He was a cool buck too. Just a fork but the widest whitetail fork I have ever seen!